What is Mobile IVR or Auto Attendant or Virtual Digital Receptionist? 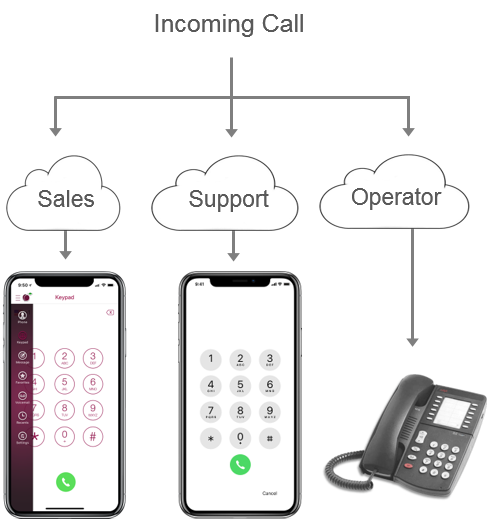 Auto Attendant, Virtual Digital Receptionist or Mobile Virtual PBX with Extensions is an all-in-one voice menu system that plays a greeting and allows callers to be transferred to an extension. You can setup one or multiple extensions with different options. iPlum has an innovative approach to flexible phone system for mobile workforce. It uses cloud based next generation technology. You can be a business with multiple employees or a solo professional to use iPlum. It is light weight and easy to setup with few clicks. What is its cost ? Cost of iPlum Mobile IVR or Auto Attendant or Virtual Digital Receptionist is $0 (Free). You can add this feature to any iPlum local or toll free phone number subscription. There is no hidden cost. There is no contract at iPlum. You will enable it at iPlum online portal..
Can I use my existing number or get a new number for setting Auto Attendant? 1. You can get a new iPlum business number and setup auto attendant. 2. You can use your existing number and set call forwarding from it to an iPlum number where you setup auto attendant . 3. You can port your existing number into iPlum. Setup iPlum auto-attendant & configure your extensions to dial your iPlum number. The callers will hear the greeting and by selecting your short extension they will be able to reach your iPlum number. If you don’t pick up it will go to your iPlum voicemail which you will be notified via email. Separate ringtone & visual screen for iPlum calls on each user’s phones as second line. You would setup a main iPlum number and each user with their own iPlum number. You can add multiple users to one extension. When an outside caller calls your main iPlum number, they will hear the auto attendant greeting. They will press extension based on your auto attendant call-flow setup. iPlum will route the call to the appropriate user. iPlum uses text to life-like speech service to create your auto attendant greeting free of charge. It uses advanced deep learning technologies to synthesize speech that sounds like a human voice. Welcome Greeting is played once when your caller dials your main number. You can choose to show call Origination Number (default settings) or iPlum Number as the display Caller-ID on the call receiving devices. This option is available in Auto Attendant Settings. These are advanced settings which define various timers and count options. Most options you will keep them at their default values. Does iPlum provide Call Recording? Yes, iPlum provides call recording feature. For compliance it includes an optional “Consent” message which you can play for incoming calls if your state requires it. You automatically get an alert via email when you have a recording which you can play in the iPlum online portal or iPlum app.